Synopsis: Native American warrior Tonto recounts the untold tales that transformed John Reid, a man of the law, into a legend of justice. Review: I made the mistake of reading too many early reviews of this update on the classic character featured first on the radio, then in a run of popular films in the 50’s, and finally on television. Words like disastrous and failure were touted loud and clear and maybe that’s why I wound up like the film far more than I thought I would. Does the film have its problems? Oh yes. Did it wind up being a total bomb for Walt Disney Studios? Oh yes. Is the film as bad as knife wielding critics would have you believe? No, not by a long shot. It’s probably safe to say that the deck was stacked against this from the start. 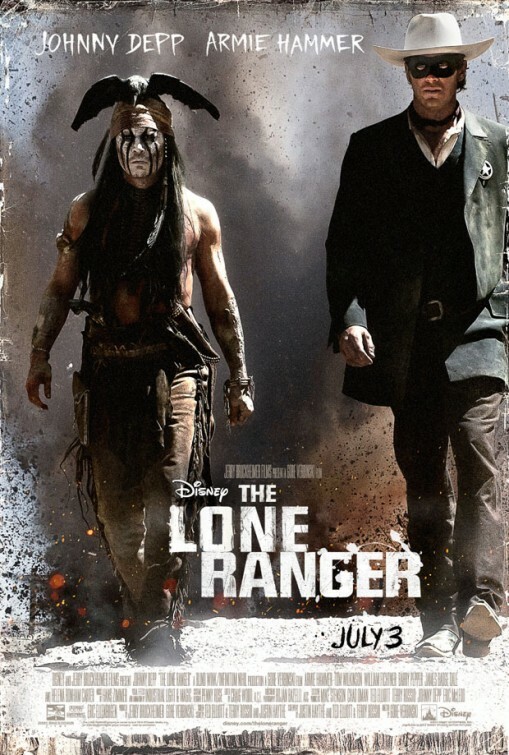 While The Lone Ranger has been a popular icon of American culture since his debut, there has been an inescapable cloud hanging over the franchise when looked at from a modern day perspective. Simply put, there are some serious un-PC stereotypes going on and even dismissing these incidents as a product of the time in which the episodes were shot can’t fully exonerate those involved. So the film had to find a way to parlay the relationship between John Reid (aka The Lone Ranger) and Native American Tonto into something more than a master/servant sort of relationship. The casting of Johnny Depp (Dark Shadows) as Tonto didn’t start things off so well. Though Depp has claimed to have Native American heritage, there were more than a few eyebrows raised when Depp, known for his broadly sketched characters, was cast in a role that already had studio heads sweating. To the credit of Depp, director Gore Verbinski, and screenwriters Justin Haythe, Ted Elliott, and Terry Rossio there are strides taken to make Tonto his own man. Given a back-story, motivations of his own, and ample screen time, the character becomes more central and fleshed out than the title character…so much so that it can feel like overcompensation. Depp bookends the story under some quite impressive old age make-up and at times I totally forgot the actor was there. Even though they spend the large majority of the film squabbling, Depp and star Armie Hammer (Mirror, Mirror) have a nice rapport and it’s their eventual team spirit camaraderie that gives the film some much needed steam as it trudges ever closer to its too long two and a half hour running length. Working with Depp for the third time, Verbinski makes a case for the resurrection of the Western though there are perhaps one too many sweaty bearded men on hand and audiences may feel they need nametags to keep everyone straight. It’s an efficient if overproduced picture that, while never boring, does meander through its middle section while Tonto and Reid find some footing in their growing friendship. Though the film markets Helena Bonham Carter (Les Misérables) as a supporting player she’s a glorified cameo with quite limited screen time. She makes the most of it though in a role that has one or two tricks waiting to be discovered. William Fichtner (The Dark Knight) is a wonderful character actor equally at home in good or bad roles. He’s a real bad guy here and the performance would be a highlight…if the appalling decision to give him a cleft palate hadn’t been employed. It’s pretty much an unforgivable move in my book. Ruth Wilson (Anna Karenina) is memorable as Reid’s sister-in-law who finds herself and her son in trouble when a greedy landowner (Tom Wilkinson, Batman Begins) sets his sights on her and her property.